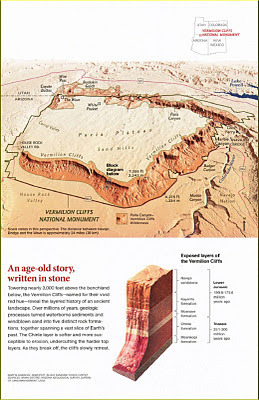 The February issue of National Geographic Magazine includes an article on Vermillion Cliffs National Monument in the Arizona-Utah border region. 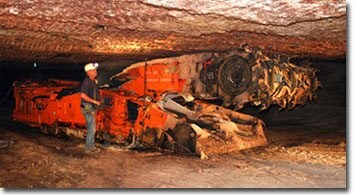 "The value of mineral production in the United States increased by 12 percent in 2011 from that of 2010. The value of raw, nonfuel minerals mined in the United States was $74 billion in 2011, up from $66 billion in 2010, according to the U.S. Geological Survey’s annual release of mineral production statistics and summary of events and trends affecting domestic and global nonfuel minerals." The metals sector was marked by higher prices for many domestically mined metals, resulting in a 23 percent increase in the value of domestic metal production. The non-metallic minerals sector increased by 3 percent, the first increase since 2007. U.S. dependence on foreign sources for minerals increased, continuing a trend that has been evident for more than 30 years. The United States relied on foreign sources to supply more than 50 percent of domestic consumption of 43 mineral commodities in 2011. 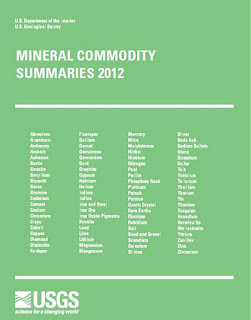 The United States was 100 percent reliant on imports for 19 mineral commodities in 2011. The Arizona Senate Natural Resources & Transportation Committee approved both SB1171 (AZGS statute reorganization) and SB1299 (AZGS 10-year reauthorization) today, unanimousely, without debate. This bodes well for passage of both bills. The bills now go to the full Senate for approval, then to the House for consideration there. Potash potential in Arizona is a major theme at this week's upcoming Little Colorado River Plateau Resource Conservation and Development Area's Winter Watershed Conference in Show Low. Pat Avery, president of American West Potash will give the Thursday luncheon speech. American West has talked about having an underground mine in operation by early 2014. On Friday, the luncheon keynote will be by Brad Traver, superintendent of Petrified Forest National Park. One quarter of the Holbrook basin potash deposit underlies the park and a similar amount is under private and state lands within the parks boundaries. I speak on Friday morning about the Holbrook deposit. 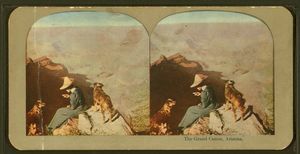 The New York Public Library has a collection of19th century stereoscopic ("3D") photos online that includes 196 from Arizona. The Robert N. Dennis Collection of Stereoscopic Views has over 40,000 items in it. The images include scenery; Native American portraits, dances, and ruins; mines; cacti; and some 'city' shots. The New York Public Library has also developed a fun online app that turns these stereoscopic images into animated GIFs. Stereogranimator creates fantastic 3D effects that wiggle back and forth to maintain the illusion. Watching a page full of them is a bit disconcerting. So far, they have created more than 11,500 of them from the original stereographs. Check out "The sinuous Colarado, yellow as the Tiber" - north from Bissell's Point. c1902-1903" below. 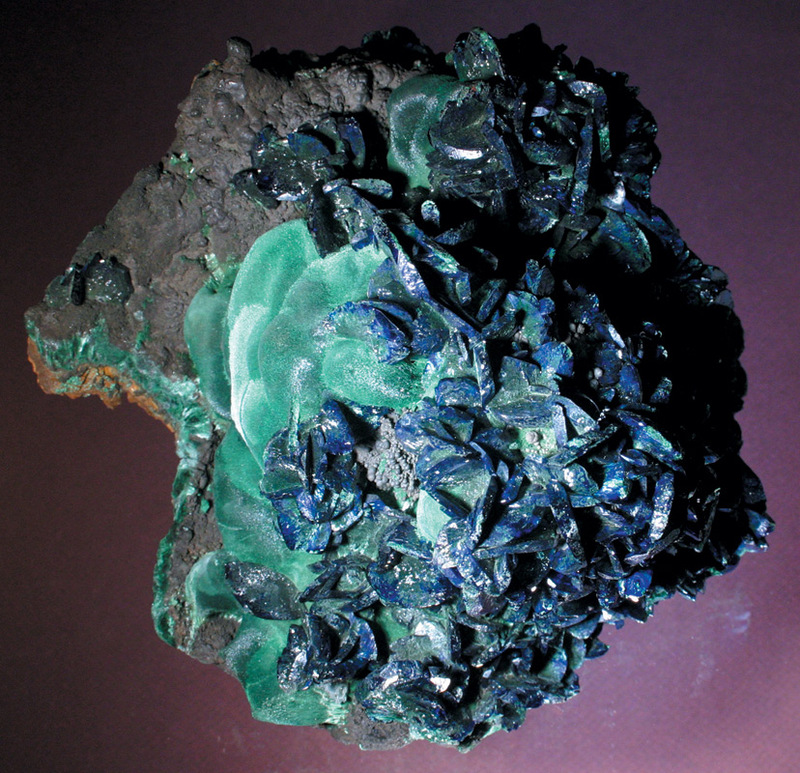 The best of Arizona's minerals will go on display in a special centennial show at the Univ. of Arizona's Mineral Museum in Flandrau Science Center, starting Feb. 4. 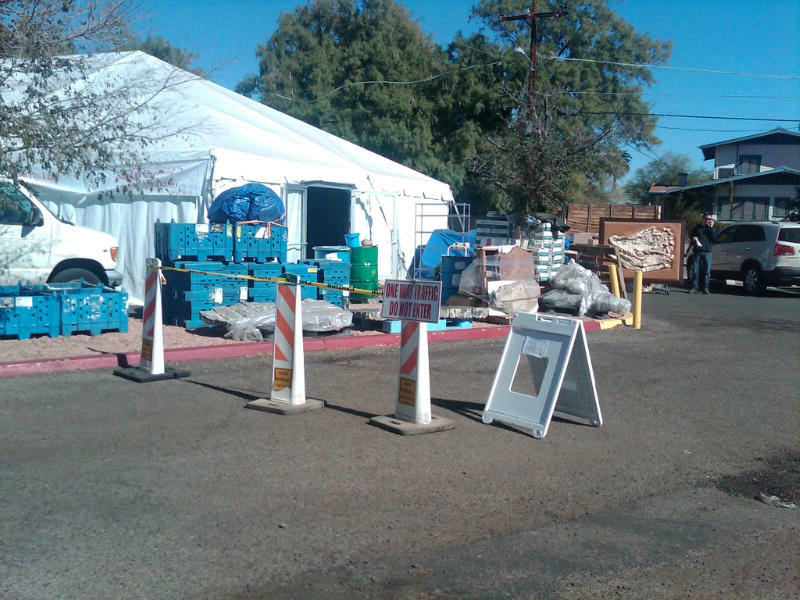 I took a quick walk through a few exhibits at the Tucson Gem, Mineral, and Fossil Showcase that got underway officially today (wheeling and dealing has been going on all week as vendors unloaded their trucks and set up displays). Here are a few Arizona specimens that caught my attention. 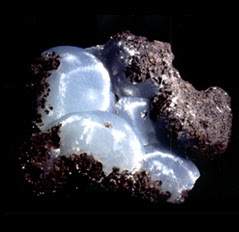 Top right- chrysocalla from the Ray Mine covered by hundreds of tiny clear quartz crystals. Top left - 3200 lb section of petrified wood, described as Douglas fir from near Petrified Forest National Park. "The tree was nearly 5 feet across and probably centuries old when it fell." Bottom - Wild West Rocks from Show Low, AZ with a garden of petrified logs. What's a kid going to do? Mom and Dad are looking at really boring rocks and the playground has been taken over by a bunch of pesky dinosaurs (no doubt they're all dumb boys to boot). 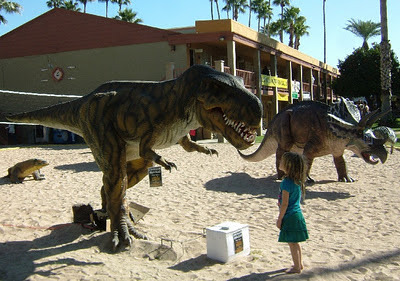 She didn't back down, even when the animated dino opened its mouth, rocked back and forth, and roared loudly. "Disaster recovery" means the recovery and mitigation activities necessary to recover from disasters after an initial emergency response, within the state caused by air pollution, fire, flood or floodwater, storm, epidemic, riot, earthquake, mining or industrial accident or other causes, except those resulting in a state of war emergency, that are beyond the control of the services, personnel, equipment and facilities of a single county, city or town and that require the combined efforts of the state and the political subdivision. Broadens exemption of districts to control tailings and waste dams, to cover all mining operations. SCR1019 "Supporting Navajo Generating Station emissions standards that balance clean air needs with state and tribal water, employment and economic needs." Microsoft Research is a partner on the AZGS-led project to build the Geothermal Data System for the US Dept. of Energy, that is being adopted by a rapidly growing list of other communities. AZGS has been providing Microsoft with ideas on how the software should work to meet the needs of our data users, and we get technical assistance with deploying and testing the software. In addition, AZGS is using Layerscape to build 3D fly-overs of some of Arizona's iconic landscapes for the Virtual Arizona Experience web portal that will go public on Feb. 14, Arizona's centennial. Field mapping in Arizona sometimes brings surprises, and not all of them are geologic. Here, AZGS geologist Phil Pearthree considers an emu who is hoping they will open a gate and let it join two others on the other side of the fence. Phil and fellow geologist Joe Cook were mapping in the San Pedro River plain when Joe snapped this photo. The entire city of Tucson looks like move-in day at the university. 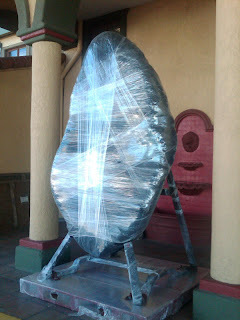 There are U-Haul trucks everywhere, unloading crates, barrels, and boxes of minerals, gems, and fossils. Early buyers are looking for deals even as sellers unpack their specimens. The Arizona [Tucson] Daily Star has an online interactive map of the nearly 50 independent shows going on around town. There's a separate article in today's paper on Arizona minerals and the main show coming up in two weeks. 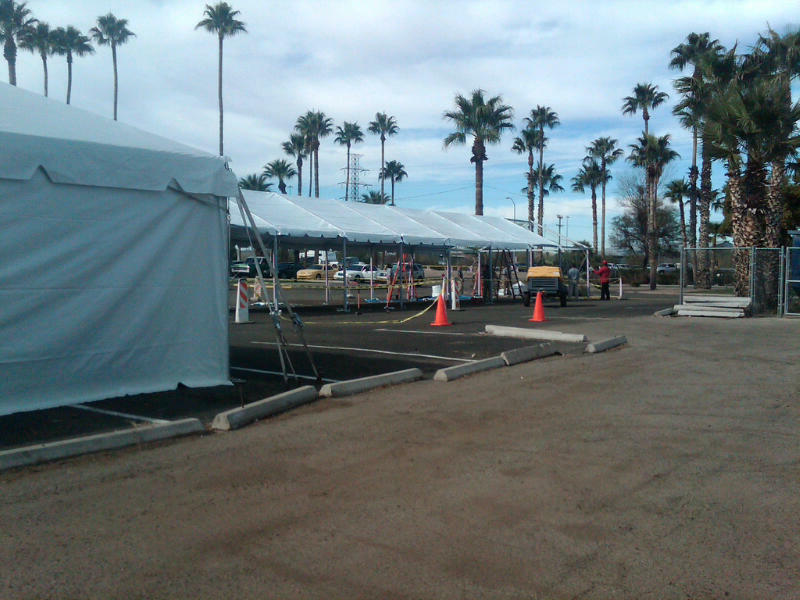 The first of more than 200 events are being held today as Arizona's first Science -Technology Festival gets underway. Events will continue, predominantly in the Phoenix and Tucson valleys, through March 14. The list of events can be searched by location, theme, audience, and type of activity. One event is a guided geology tour/hike at Papago Park led by ASU's Prof. Jack Farmer. Other: Park at the Hole in the Rock parking lot. We will take some short hikes on moderate to steep slopes; wear sturdy shoes. A camera is strongly recommended. The bill to reauthorize the Arizona Geological Survey in state statute was introduced in the Legislature today and will be heard by the Senate Natural Resources and Transportation Committee at 2PM, Monday, Jan. 30 in Phoenix. 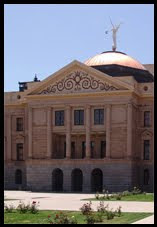 Senate Bill 1299 extends the life of AZGS ten years, from July 2012, July 1, 2020, the maximum period allowed. In addition, SB1171 is scheduled to be heard at the same time, which reorganizes the statutes for AZGS with those formerly for the AZ Dept. of Mines & Mineral Resources, and cleans up language to be consistent across all sections. ADMMR and AZGS were merged last year through a budget bill, leaving the combined duties scattered across different statutes. The Legislatures Sunset Review Committee gave unanimous, bipartisan approval last Fall to reauthorize AZGS. The committee commented on the broad support for AZGS that they received from stakeholders and users of AZGS services and data. Environmental groups want the EPA to reclassify it from solid waste to toxic waste. 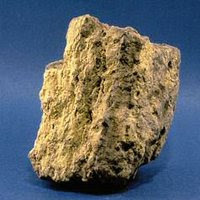 But about 40% of the ash is recycled into things such as cement and dry wall. The Edison Electric Institute argues that designating the ash as toxic will make it less likely to be recycled, resulting in more of it piling up in pools and landfills. Environmental groups are preparing to sue EPA to force them to classify the ash as toxic, acknowledging they want to make this an election year issue. The White House says that no matter how ash is regulated they want it to continue to be recycled. 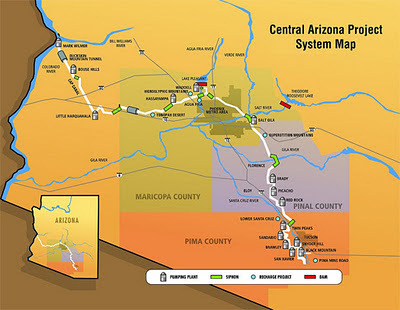 Phoenix and Tucson get much of their water from the Central Arizona Project, "the country's largest and most expensive water-delivery system," according to an excerpt from a new book, "The Very Hungry City," by Austin Troy [right, CAP system map, from the book]. 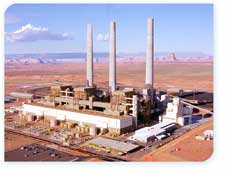 Troy notes that CAP relies on the Navajo Generating Station, a coal-fired power plant at Page, to supply the electricity to run 14 pumping stations that "are required to keep water moving along this 336-mile infrastructural straw, which includes a rise of 3,000-feet in its journey from Lake Havasu to southwest Tucson." Pumping costs account for 42% of waters cost to CAP users, and they have no where else to turn for electricity. As a result he argues that "the future price of energy — and hence of water — is bound to the price of coal." And the availability of coal as a fuel source for NGS, a subject of debate over air quality issues. The availability and cost of water has a big impact on certain Arizona industries. While agriculture is generally considered the largest water user, Troy points out that Intel is Phoenix's biggest water consumer, using 7 million gallons a day in its computer chip manufacturing facilities, but cleaning and returning 3/4 of its wastewater back into the aquifer, for a net use of 2 million gallons daily. He raises the question whether new industries will consider setting up in Arizona, if they are similarly dependent on water supplies. He predicts a time when agriculture and urban water users will have to square off: "But most water in the West is now used to irrigate crops; city dwellers get what’s left. And in these arid lands agriculture has been subsidized for decades through the provision of water below the cost of delivery. There may come a time when western water managers will need to ask whether desert agriculture — a vital source of America's food supply — is worth the cost." The excerpt that I read came across as honest and frank in its assessment. Troy leaves it to the reader to make his/her own judgement although the description he offers leads one to appreciate the fragility of maintaining cities in the desert. I appreciated the focus on solid information without overt proselytizing or polemics. The world produced 118 million pounds of uranium in 2010 but consumed 190 million pounds. The deficit is made up from Cold War era supplies and conversion of Soviet nuclear weapons. But according to story on Mineweb.com, Thomas Drolet, the president of Drolet & Associates Energy Services, predicted during a presentation at Cambridge House's Vancouver Resource Investment conference, that a uranium shortage will hit the world by 2016. He assumes that at least 30 of Japan's 50 idled nuclear reactors will be brought back on line to meet power demands. Arizona is increasingly recognized by the mining industry as having some of the richest deposits in the nation, hosted in hundreds or even thousands of breccia pipes across the northern part of the state. The recent 20 year ban on exploration and mining imposed by the Secretary of Interior on a million acres of federal lands took out some of the highest concentrations of breccia pipes in the region. However, Tucson-based Liberty Star Uranium noted in a letter to investors that the federal ban could increase the value of remaining uranium properties in the region by further restricting supply. In addition, shale gas production continues to expand across the country, leading ExxonMobil to project that by 2030, natural gas will surpass coal as an energy source. 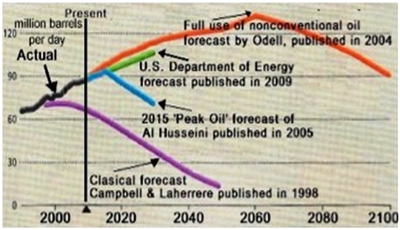 ExxonMobil also predicted that oil demand will rise to 100 million barrels per day (compared to 88 MBPD now), and gasoline consumption will decline despite 400 million more cars on the world's roads, because of fuel-efficiency improvements. 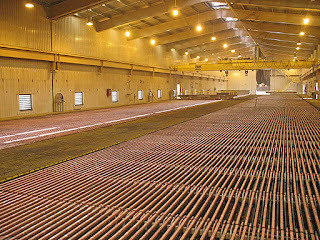 The total direct economic impact of Arizona's copper production was $3.676 billion, including $194.4 million in taxes and fees to state and local governments (up 28% over 2009), $2.512 billion in services and products purchased (up 19% from 2009), and $970 million in income (up 26% over 2009) to 10,400 Arizona employees. 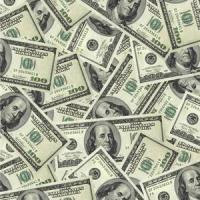 The combine direct and indirect economic contributions for 2010 exceeded $12.1 billion (up 31%). The study was prepared for the AMA by Dr. George F. Leaming of the Western Economic Analysis Center, in Marana, AZ. Famed oil industry expert and author Daniel Yergin attributes the costs to "the fundamentals of supply, demand, and costs." World demand is at a record 89 million barrels a day, while supplies were disrupted by civil war in Libya, and costs of operating in extreme environments are rising. Tensions over Iran's threat to close the Straits of Hormuz exacerbate the price rise. The Arizona SciTech Festival welcomes the assistance of volunteers to help coordinate the many events and activities happening in conjunction with the festival. More than 200 events across the Phoenix and Tucson valleys get started January 25 and run through March 14. AZGS has copies of programs and promotional fliers in our Tucson store, if you want some to distribute to your organizations to help promote the events. 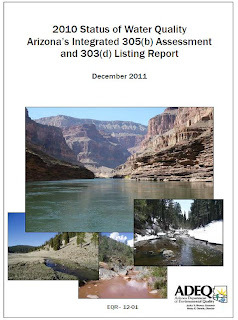 Arizona Department of Environmental Quality officials released a draft version of a report that examines surface water quality in Arizona is available for public review and comment. The Arizona Section of AIPG has scheduled their annual meeting and review of the geology profession in Arizona, for Sat. 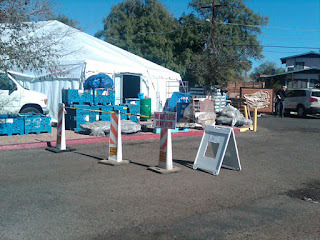 Feb 11 at the AZGS offices in Tucson. This is an annual event that brings in leaders from state, federal, and professional organizations to give short briefings on key topics. The AIPG National Board of Directors will also attend. Their mid-year meeting will be held in Tucson, Feb. 10. Events take place in 40 separate shows from January 28 through February 12. One of our geologists, mapping in southern Arizona, stumbled across two large bundles wrapped in plastic and burlap. 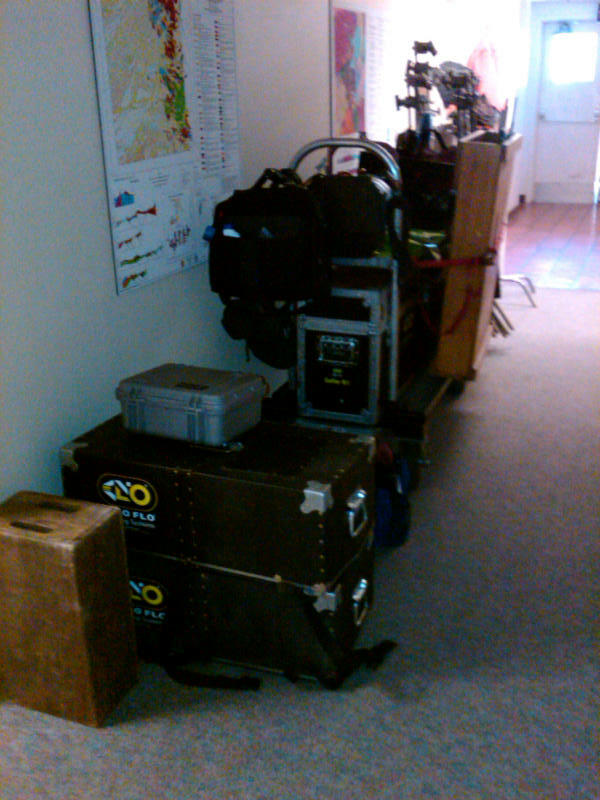 We gave the GPS coordinates to the county sheriff's office who recovered not only these drug bundles but several others. Recent rains wiped out indications of how long the bundles may have been there. They warned us that the region from Bowie to the New Mexico state line is a smuggling corridor and to take appropriate cautions. A study by federal agencies appears to support Navajo Nation president Ben Shelly's arguments that EPA requirements to retrofit the Navajo Generating Station power plant near Page, are unnecessarily expensive with little benefits, and other approaches would meet environmental goals. "Low-cost power from Navajo GS runs the massive pumps of the Central Arizona Project (CAP)" delivering Colorado River water across Arizona. Environmental groups want the plant shut down over fears that it is a source of haze at the Grand Canyon. The new report from the National Renewable Energy Lab (NREL) concludes that it "is inconclusive as to whether removing approximately two-thirds of the current NOx emissions from Navajo GS would lead to any perceptible improvement in visibility at the Grand Canyon and other areas of concern." The NREL study entitled “Navajo Generating Station and Air Visibility Regulations: Alternatives and Impacts” was completed under an Interagency Agreement between the Department of the Interior (Interior) and Department of Energy (DOE). This study addresses the various issues that EPA must consider in designing the BART [Best Available Retrofit Technology] rule for NGS. Critics argue that the BART rule focuses entirely on technology rather than results and does not consider costs or benefits. There are strong economic pressures to keep the power plant open. NREL notes that Tribal economic benefits associated with the direct operations of both the Navajo GS and Kayenta coal mine that supplies the plants fuel, are more than $150 million per year. primarily go to schools in the region. SRP also pays the Navajo Nation about $1 million/year in lease and air permit fees for the Navajo GS itself." NREL found that adopting some of EPA's requirements would likely increase water rates from CAP between 13% and 16% for agricultural users and Indian tribes. For municipal and industrial users, the increase would likely be between 5% and 7%. These increases would roughly double under additional EPA requirements. "If Navajo GS were to shut down, the Indian and Agricultural users of CAP water would see per acre-foot increases of as much as 66%, while municipal and industrial users would see increases up to 52%." A 3-year, $5 million feasibility study is being undertaken. The ranch previously announced plans for a solar energy project that generated heated debate over hunter access to State Trust Lands checkerboarded among the ranches private lands. One outcome of the Legislature's 10-year Sunset Review of the Arizona Geological Survey last fall, the review committee recommended making corrections to our statutes. Those changes are the basis for Senate Bill 1171, introduced yesterday. The intent is to simplify the release of earth fissure maps, and to integrate the statutes from last years Mines & Mineral Resources merger with AZGS. The fissure language adopted 5 years ago specified AZGS deliver map results every five years for release by the State Land Dept. Instead, we release new maps as each is completed. 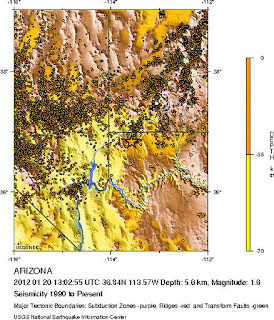 In addition, AZGS now publishes the maps online immediately rather than after a 90-day waiting period that was expected. Working with the State Land Dept, we cut the costs of doing this by $20,000 per year. The legislation recognizes these benefits by revising the statute to formally incorporate these changes. The second change is to put the revised ADMMR and AZGS statutes into the same section in code. That is normally how it would have been done at the time of the merger, but the consolidation last year was accomplished through a budget bill as the Legislature rushed to wrap up its work. As a result, the sections are in different chapters and there were wording differences between the two sections that we presented at the Sunset Review and asked for clarification. The committee chair, Sen. John Nelson, called together a broad range of stakeholders to solicit their input on integrating the sections, which led to SB1171. There are no substantive changes to the consolidation approved last year. 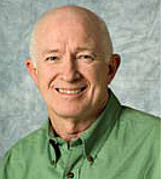 Mr. Salisbury was President and CEO of Resolution Copper Mining ("Resolution") from 2008 to his retirement on January 31, 2011. At Resolution he was responsible for the development of a deep underground copper mine in Superior, Arizona. One of his primary responsibilities was a legislative land exchange involving 3025 acres of federal land in exchange for 5500 acres of ecologically important private land. His role at Resolution required significant interaction and engagement with members of the U.S. Congress, federal agencies, the Governor of the State of Arizona and State legislators. He was also responsible for leading the activities of integrating all engineering studies and design with environmental permitting, progressive development of the future operations culture and working environment, health and safety, project budget controls and community relations. This may indicate a shift in the company's efforts from exploration towards development. I'm finishing up my slides tonight for a briefing in the morning (Wed) to the Arizona State Senate Commerce and Energy Committee on potash in Arizona. Aggressive exploration by three companies in the Holbrook basin is confirming AZGS estimates of a large, shallow, accessible deposit that could hold as much as a quarter of the nation's potash resources. There is growing interest across the state in understanding more about the impacts of this potential new industry. Arizona Public Media broadcast a 5-part series on Copper at the Crossroads, that is posted online, with podcasts, slide shows, and links to other reports. 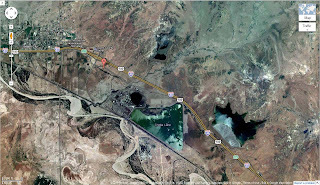 There is a particular focus on the Rosemont copper mine proposal. Part 1: The Miracle Metal -- The history of copper mining in Arizona, from underground mines to vast open pit operations. Part 2: To Dig or Not to Dig? 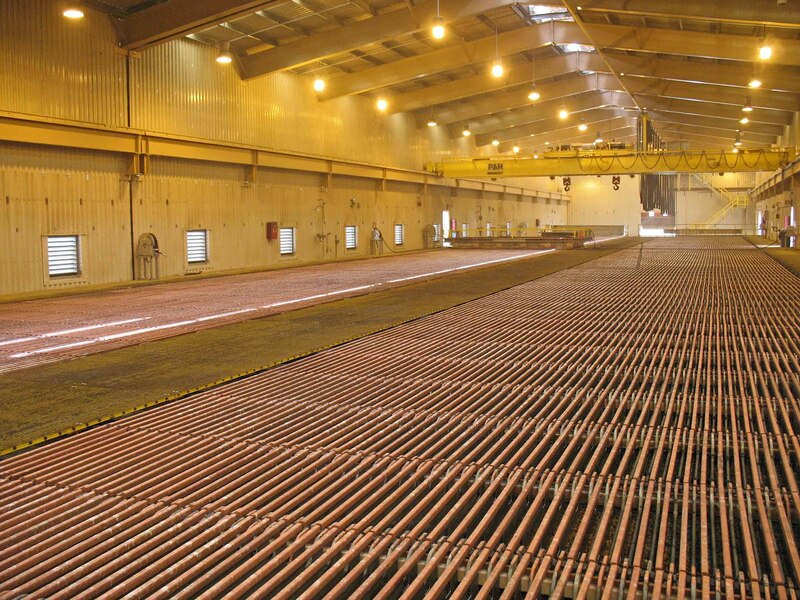 -- The debate over the open-pit copper mine that Rosemont Copper wants to build near Tucson. Part 3: 'That Mine Was My Mother' -- Meet Onofre Tafoya, who worked for years at the San Manuel Underground Mine. Part 4: Some Thrived, Some Died -- The history of Arizona's copper mining towns. Part 5: Arizona's Toxic Town - A visit to Hayden, Ariz., one of America's most toxic towns. ASU's Daniel Sarewitz asks in his monthly column in Nature, why mission-directed science agencies such as the USGS, lag so far behind in funding compared to basic research agencies like NIH and NSF, whose budgets have doubled or tripled. Since 1996 (16 years ago), the USGS budget has risen 16%, not even keeping up with inflation. Dan argues that "it wasn't supposed to be this way. America's pragmatic culture has long been assumed to favour applied investigation over fundamental science..."
After all, "Mission agencies provide knowledge — fundamental and applied — to address social problems as diverse as preventing and preparing for natural and technological disasters, providing the scientific basis for environmental monitoring and protection, dealing with public-health threats such as obesity and emerging infectious diseases, and developing the standards and measures that facilitate technological innovation." He ascribes part of the problem to the support for science funding comes mainly from those engaged in basic rather than applied science - universities, the National Academies, the professional scientific societies and so on. I have to agree. Universities increasingly rely on federal funds to operate. The University of Arizona for example gets something like only 30% of its revenues from the State. So, every VP of Research and Dean of Science across the country pounds on the desks of their congressional rep, arguing for more funding of NSF and NIH, because those agencies are mostly funding sources. The USGS on the other hand, holds onto its money tightly, arguing they don't have funds to carry out their own core missions, so how could they possibly share any with other groups. As a result, the USGS doesn't have the same kind of stakeholder advocacy as do the basic science agencies. In 2008, a group of prominent scientists proposed merging the USGS and NOAA to create an Earth Systems Science Agency. A key element of the ESSA would be that "No less than 25% of ESSA's budget should be devoted to grants, contracts, and cooperative agreements with academic and nonprofit institutions." Clearly, they recognized the need to build a politically powerful constituency. It will be of great interest to all of us to see if the President's proposal to move NOAA from Commerce to Interior will also include a change in philosophy on how funds are spent by the agencies. 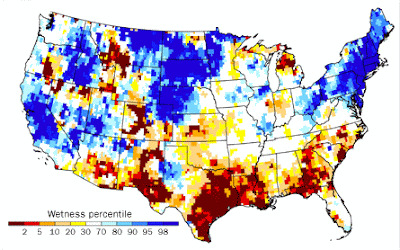 A new analysis of ground water changes as measured by the GRACE satellites (Gravity Recovery and Climate Experiment) finds that “Groundwater is being depleted at a rapid clip in virtually of all of the major aquifers in the world's arid and semiarid regions,” according to Jay Famiglietti, a hydrologist at the University of California Center for Hydrologic Modeling in Irvine, as reported by Science News. The data were released at last months AGU Fall Meeting. Bloomberg says "Producing natural gas from shale will support 870,000 U.S. jobs and add $118 billion to economic growth in the next four years," according to a report from IHS Global. The potential for shale gas in Arizona has not been seriously examined. The Arizona-Sonora Desert Museum's annual Mineral Madness event is next weekend, Jan. 21-22, west of Tucson. It's a good warm-up for the Tucson Gem, Mineral, and Fossil Showcase that really gets going a week later. The Arizona Oil & Gas Conservation Commission reports that 75 drilling permits were issued 2011, setting a record for the number of permits issued in a single year. 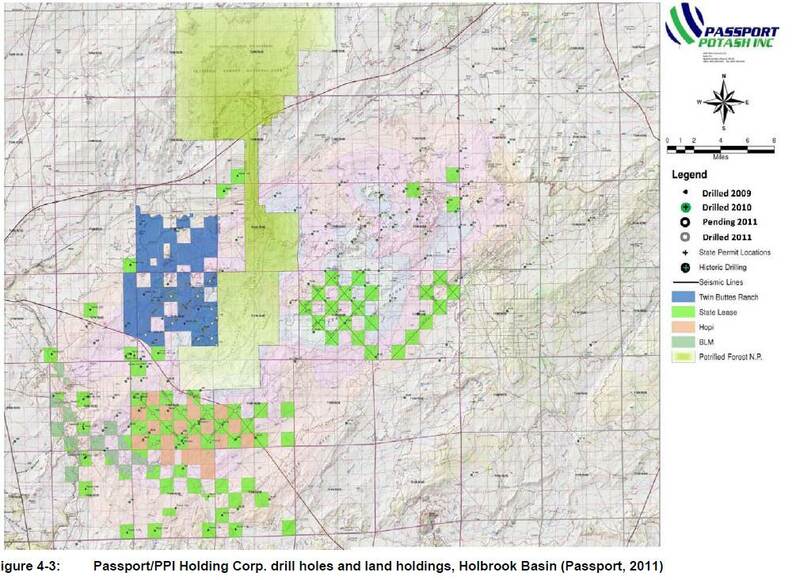 All but two permits and all wells drilled were stratigraphic tests for potash in the Holbrook area. The two non-potash permits were for obligation wells at the St. Johns Gas Unit, according to Oil & Gas Administrator Steve Rauzi. 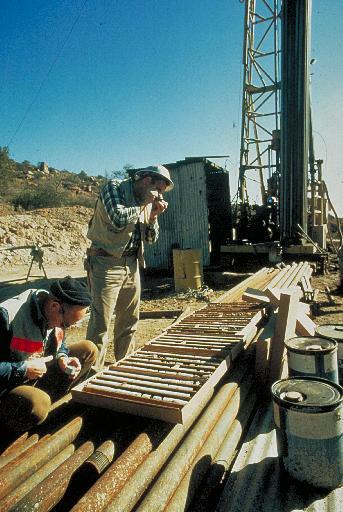 Three companies drilled a total of 67 stratigraphic tests in 2011. 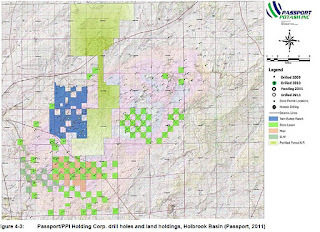 Southwest Exploration/Passport Potash drilled 31 wells at its potash project west and southwest of Petrified Forest National Park [right, credit Passport Potash]. 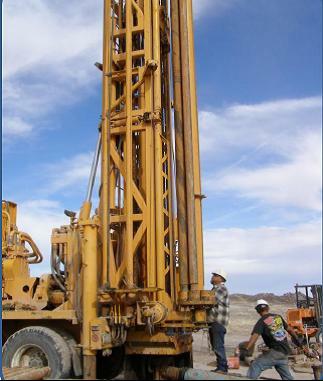 HNZ Potash drilled 24 stratigraphic wells southwest and east of the Park. American West Potash drilled 12 wells at its project area east of the Park. All 3 companies finished their 2011 drilling programs and have plans to permit and drill additional wells in 2012, according to the annual report that will be presented to the AZOGCC next Friday, January 20 at its quarterly meeting in Phoenix. 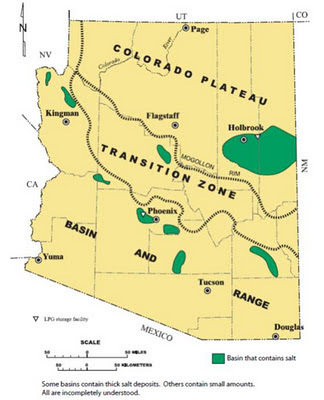 The companies are required to permit the potash test wells with the Commission because the holes penetrate the Coconino Sandstone, which is a potential helium reservoir in the region. The proposal by Kinder Morgan CO2 Co. to purchase Enhanced Oil Resources (Ridgeway Arizona Oil Corp.) carbon dioxide properties between St. Johns and Springerville and in adjacent New Mexico, is now expected to be completed by January 31. The Arizona Geological Survey provides all the technical and staff support for the Oil & Gas Conservation Commission, as the Commission has no staff of its own. President Obama's proposal to move the National Oceanic and Atmospheric Administration from the Commerce Dept. to the Interior Dept. may have a tough road. AAAS's Science Insider blog says "there is broad agreement that the plan will face serious opposition in Congress." 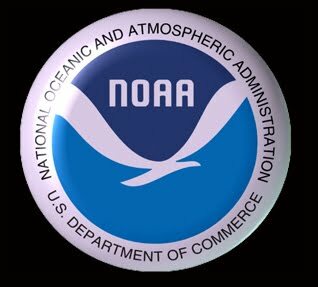 NOAA houses the National Weather Service, the National Environmental Satellite, Data, and Information Service (NESDIS), the National Ocean Service, among other programs. Science Insider also offered an explanation of why NOAA is in Commerce instead of Interior to begin with: "President Richard Nixon was furious when his interior secretary, the politically volatile Wally took aim at the Administration's Viet Nam War policy. So Nixon punished him by not making the newly created NOAA part of the Interior Department, which already housed the U.S. Geological Survey." Long time readers of this blog may recall that I reported back in 2008 that the Obama Transition Team was considering merging NOAA with the USGS in Interior. Earlier in 2008, a group of prominent scientists made the case for combining USGS and NOAA into an Earth Systems Science Agency, in an influential article in Science. State Senator Al Melvin's proposal to store high level nuclear waste in underground salt caverns in Arizona is drawing attention in the state's news media. We recommend a couple of references for background on this. Sandia National Lab released a report a year ago on "Salt Disposal of Heat-Generating Nuclear Waste." The 110-page report is available online at http://prod.sandia.gov/techlib/access-control.cgi/2011/110161.pdf. This report identifies 3 salt bodies in Arizona - Red Lake north of Kingman, Luke west of Phoenix, and Supai (or Holbrook) under and east of Holbrook in eastern Arizona. AZGS published a report in 2002, "Arizona Has Salt!" (AZGS Circular 30, 41p) that summarizes what we know (and don't know) about the many salt bodies around the state. This is available online for viewing or free downloading. 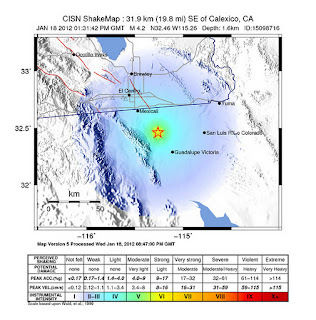 In August, 2011, Sandia issued a companion report, "Granite Disposal of U.S. High-Level Radioactive Waste." The latter report is generating a lot of attention in the last few weeks in eastern and northern Midwestern states that were mentioned as having potentially suitable host rocks.